Everyone needs a really good salad recipe (or a dozen) up their sleeve. 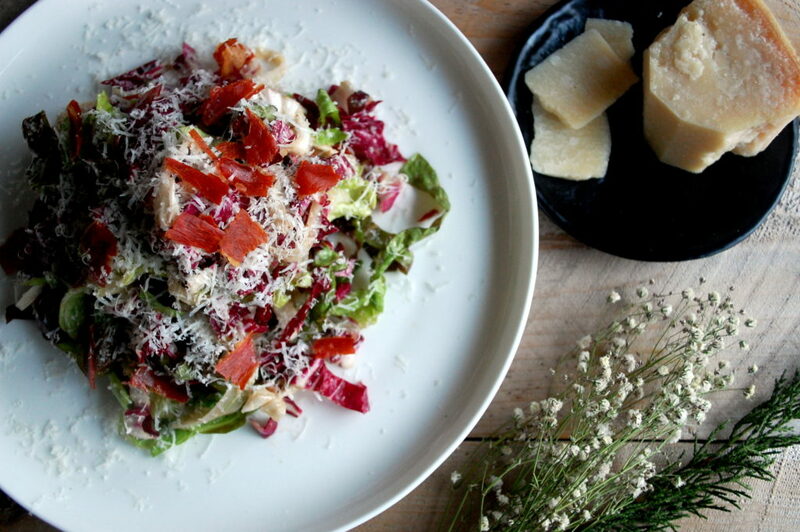 Either as a light weeknight meal or a crowd-pleasing first course, this radicchio & fennel salad is simply delicious. 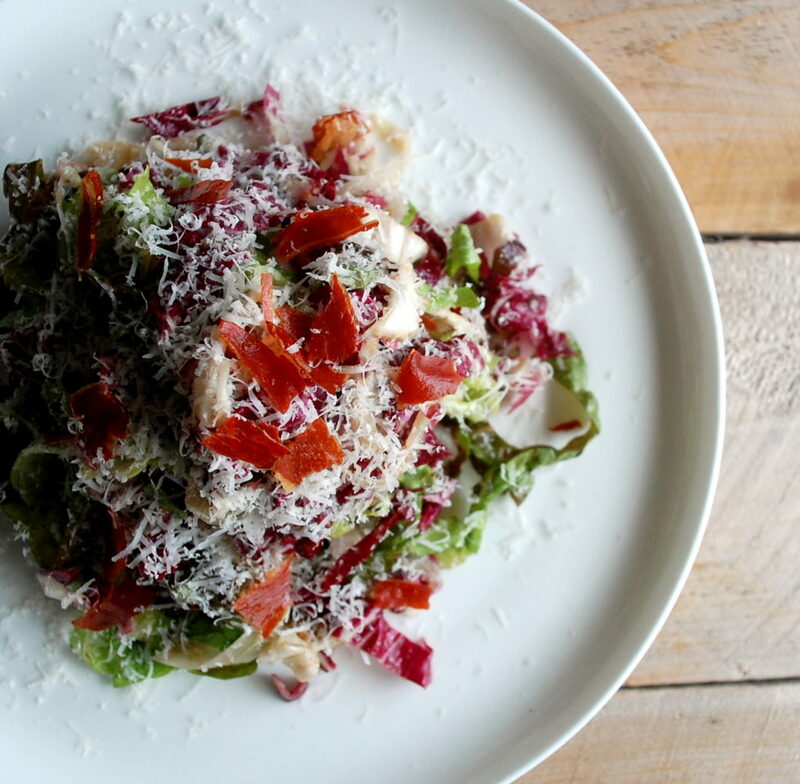 Salads in general rely on one thing: the dressing. 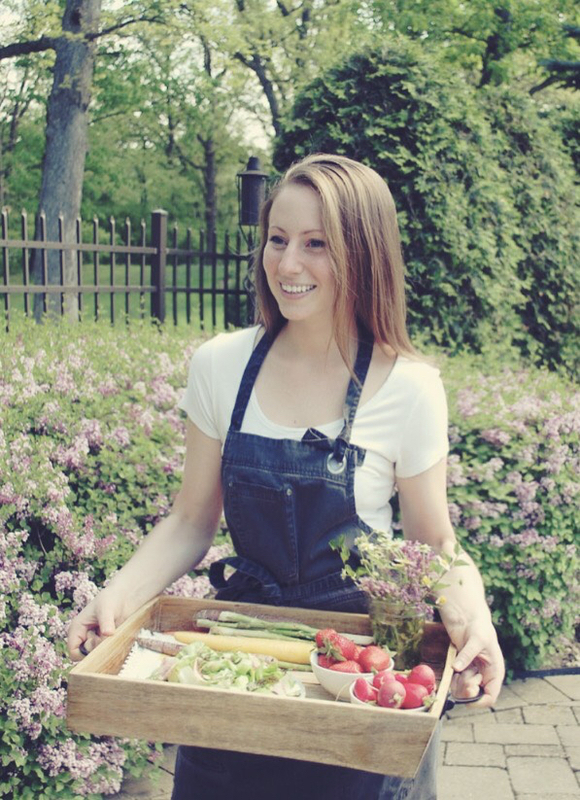 A properly dressed salad that uses a properly seasoned dressing can make or break your salad. It can turn it from the part of the meal that gets pushed to the side of the plate into the dish that everyone can’t get enough of. You have to think of it this way, once the dressing gets tossed with the salad, the greens and other components will somewhat water it down, making it taste less flavorful. That’s why on its own, the dressing should actually taste over-seasoned, so that when it’s mixed with everything else, it’s perfect. The amount of dressing in the salad is important, too. I like to cut the greens in thin strands and the other components in small strips or pieces. This way it’s easier for the dressing to coat everything well, compared to big chunks of salad having dressing just drip off. The dressing should provide a generous, glossy coating on the ingredients without drenching them. Once you achieve the perfect balance of seasoning and dressing, you can get creative with other ingredients that will only enhance the flavor of the salad. 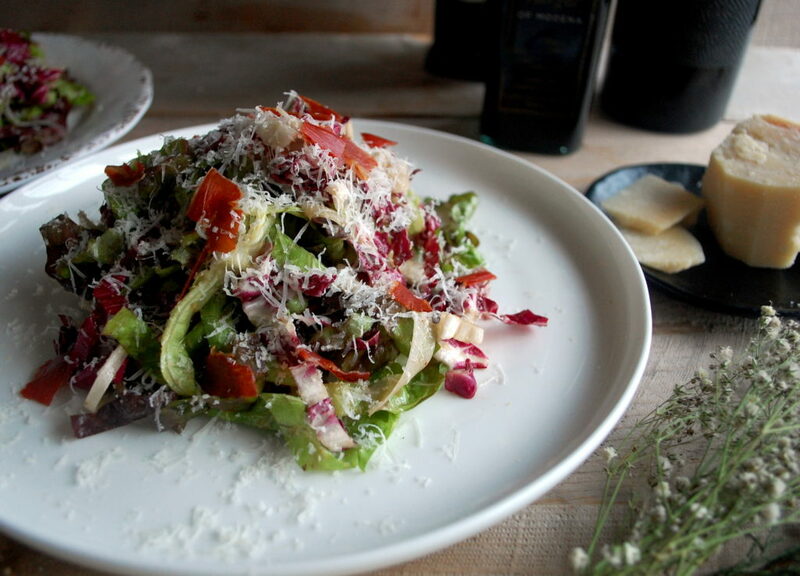 I use fennel and lots of Parmesan cheese to complement the tangy balsamic vinaigrette. A little salty prosciutto on top rounds everything out into one delicious dish. Enjoy! In a mixing bowl, whisk together the balsamic vinegar, honey, whole grain Dijon mustard, and garlic until combined. Drizzle in the olive oil very slowly, whisking continuously so that the vinaigrette emulsifies and thickens. Add the Parmesan cheese. Season the vinaigrette with salt and pepper (it should taste somewhat salty). Reserve until serving. Preheat the oven to 300°F. Lay the prosciutto onto a baking sheet in one layer. Bake until crispy, about 20 minutes. Let cool. Crumble each piece into bite-sized pieces. Meanwhile, take the head of radicchio and cut in half lengthwise. Place each half flat side down and slice the radicchio into ¼” strands, working toward the root end. Discard the root. Soak the strands in cold water for about 30 minutes. Drain and let the radicchio completely dry in one layer on a paper towel-lined tray. While the radicchio soaks, cut the red-leaf lettuce in similar strands, rinse, and dry. Take the fennel and shave it into thin strips on a mandolin, discarding the core. 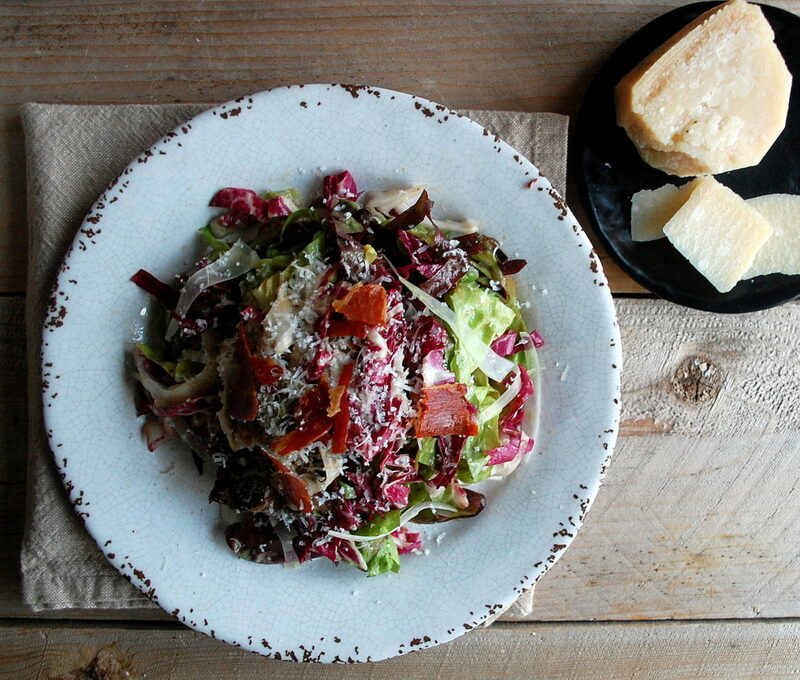 To assemble the salad, combine the radicchio, red leaf lettuce, and shaved fennel in a large mixing bowl. Add half of the balsamic vinaigrette and toss to combine. Add enough more to completely coat the greens, reserving any extra for a later use. 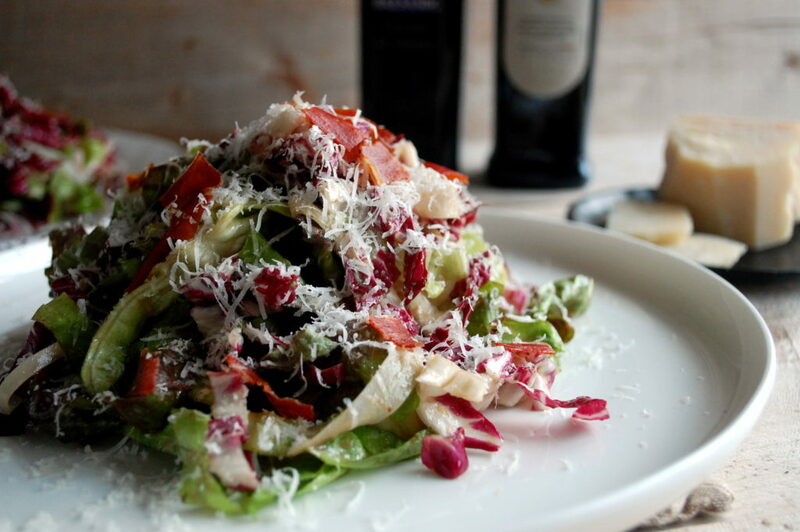 Serve each plate of salad with a generous grating of Parmesan cheese over top (the more the better). Garnish with the crispy prosciutto pieces. The radicchio is soaked to take away some of its natural bitterness. Make sure to completely dry the strands before tossing with the dressing. I use a microplane (basically what you would use to zest a lemon) to grate the chunk of Parmesan cheese. This results in a soft, almost fluffy texture that is really much better in the salad than a store-bough grated cheese. I would highly recommend doing this!